Among the treats I wanted to introduce my granddaughter Grayson to during our trip was a ride on three streetcar lines. 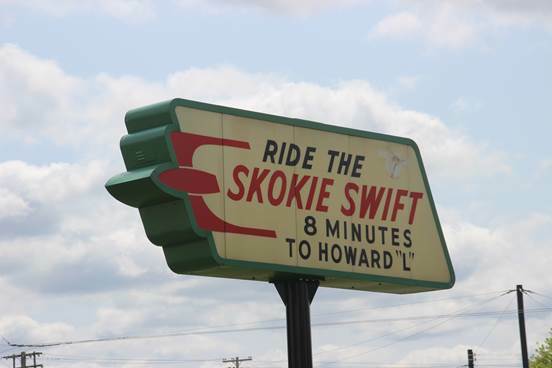 The first two were at the Illinois Railroad Museum (IRM) located in Union, Illinois. 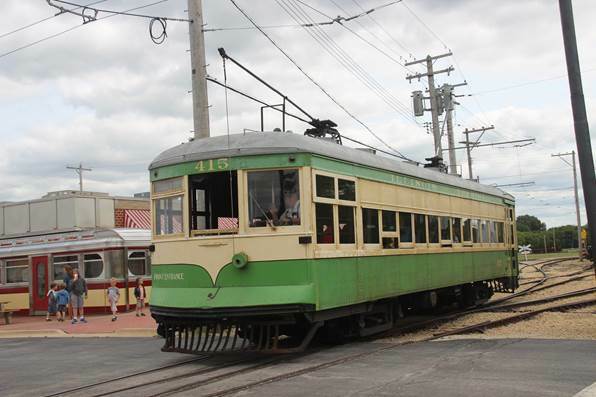 At IRM, we rode former Illinois Terminal Railroad interurban car #415. The car makes two different runs at the Museum; the first is a 1 mile loop through the museum grounds while the second is over a 4.9 mile line that runs out into the countryside. A ride on the loop track is a very nice way to get an overall view of IRM since the car weaves its way through the museum’s grounds on its trip. The interurban run through the countryside, while not high speed, gives one a feeling of what riding early 20th century rural interurban lines was like. Normally Mary Ann and I ride the streetcar when we first arrive at IRM and ride it again as we leave. Not wanting to push Grayson’s tolerance for visiting a railroad museum, we only half- heartedly explored the train sheds on IRM’s property. I was able, however, while Mary Ann and Grayson had an ice cream cone and took another ride on #415, to once again view IRM’s superb collection of outdoor interurban company advertising signs and walk through some of the Museum’s carbarns. 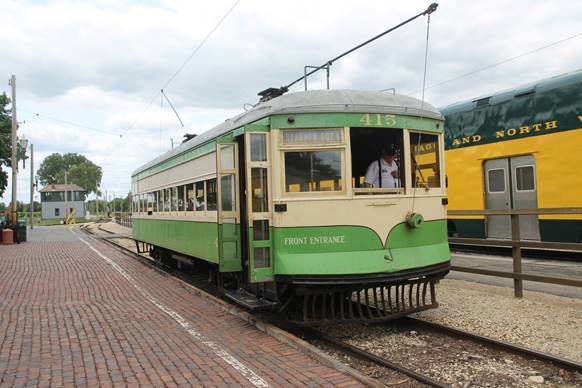 If you have never visited IRM, you should make it a priority; it has something of everything to satisfy the most diehard railfan, streetcar-interurban aficionada, and trolley bus fanatic. From Union, Illinois, we drove to Kenosha, Wisconsin, so we could ride the local streetcar line. The line, built in 2000, is a 2 mile loop through the city’s downtown area; construction of an extension to the line is to start in 2016. The line presently operates four PPC streetcars in the livery of four cities in which PPCs once ran: Pittsburgh, Cincinnati, Chicago, and Johnstown. While I had hoped to ride the Cincinnati car, we had to ride in the Pittsburgh car. The motorman told me that they normally only operate one car each day, with a rotation schedule to ensure each PPC car is run every four days. At Kenosha, we rode the second last and the last run of the day. We shared the car with eight other people on the second last run but had the car to ourselves for the last run. The motorman took time during this run to talk about the system and tell about what we were passing outside the car. 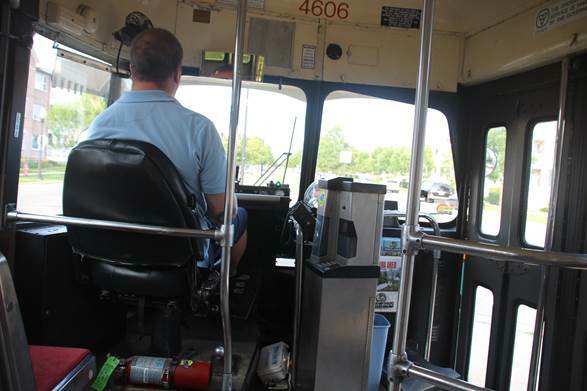 He said that he would far rather operate the streetcar than drive a bus. Operating a streetcar, according to him, was fun; driving a bus was work. If you are traveling on I-94 between Milwaukee and Chicago, stop and get off at Kenosha for an hour or two to ride their streetcar line. 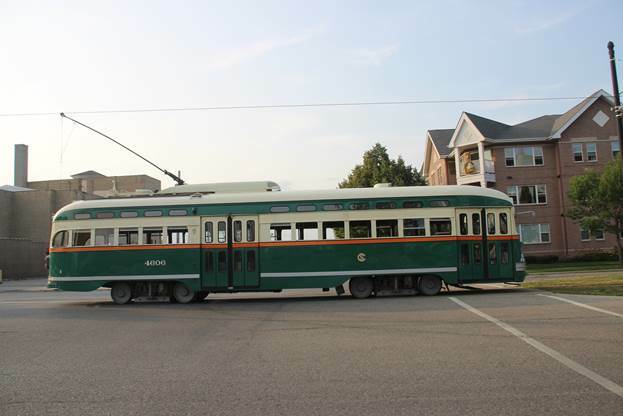 It is a fun ride, and you may even get to ride on the Cincinnati car. 1. Illinois Terminal car #415 at the depot returning from its 10 mile run out to and back from the countryside. 2. 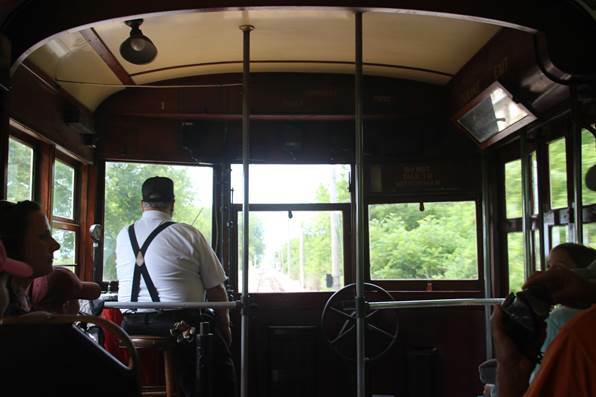 A view forward, looking at the motorman as he runs car #415 through the countryside. 3. Car #416 is seen leaving the Dinner Car Stop as it loops through IRM’s grounds. To the left is the Diner where Mary Ann and Grayson got their ice cream. The following is a selection of the outdoor interurban line advertising signs IRM has in its collection. 5. 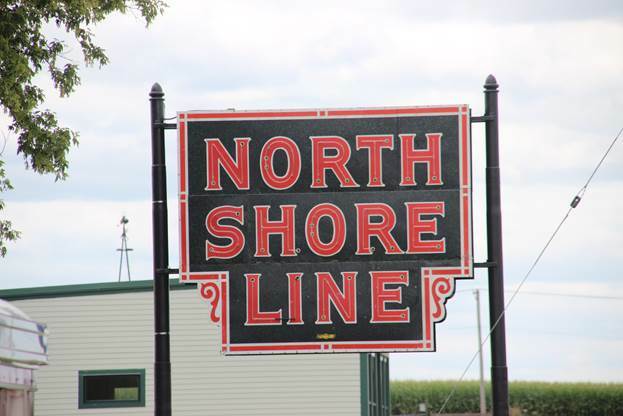 North Shore Line sign. 6. 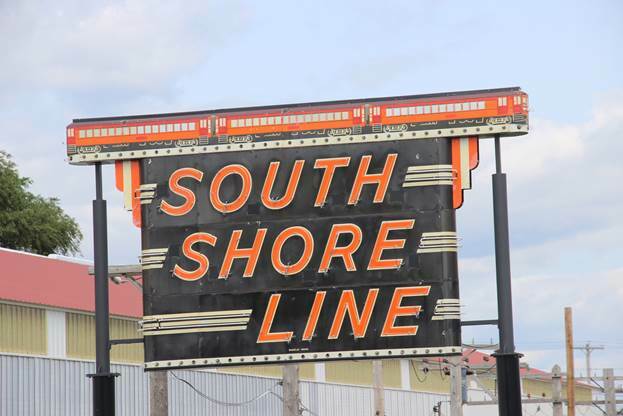 South Shore Line sign. 7. 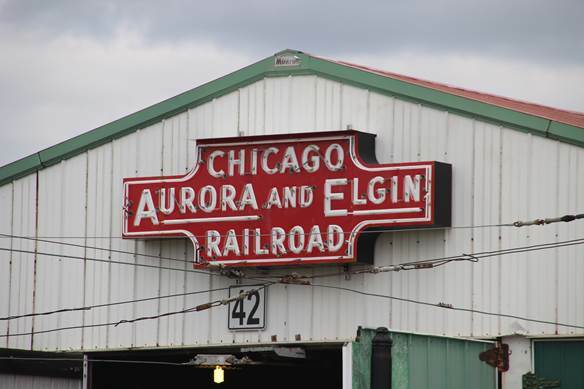 Chicago Aurora and Elgin Railroad sign. 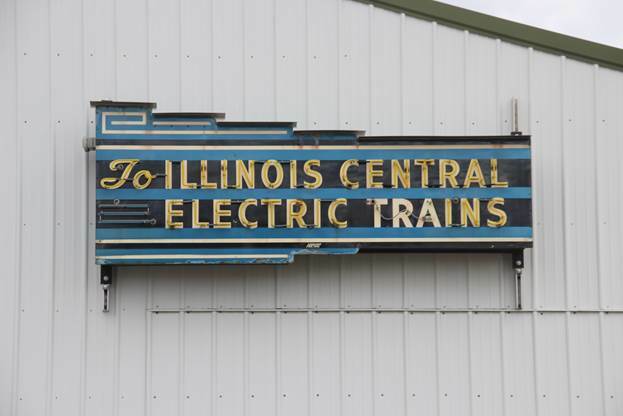 8. to Illinois Central Electric Trains sign. 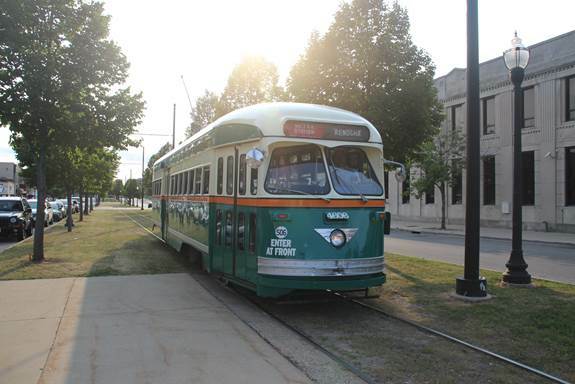 The following are two views of Kenosha’s PCC car #4606 in Pittsburgh Street Railway colors. 9. Car #4606 head on view. 10. Car #4606 side view. 11. A view from car #4606 looking forward toward the car’s motorman.